Loveable because of their wide range of art magazines. The store on Broadway Market is lovely. It's small but they have so much! (Art, fashion, graphic design, etc.) Especially the magazine collection is stunning. Loveable because because going there means immersing yourself in a book journey. Impossible to leave empty-handed. Libreria looks like a small book store in Italy (hence the name probably) but has a great selection. The shop triggers you to discover new things as they don't sort the books by the usual categories, which is refreshing and inspiring. Loveable because of their collection of (East) London books. Cute little independant bookshop on Brick Lane with a broad range of (East) London books. Read their history here. Loveable because of the breathtaking Edwardian interior. 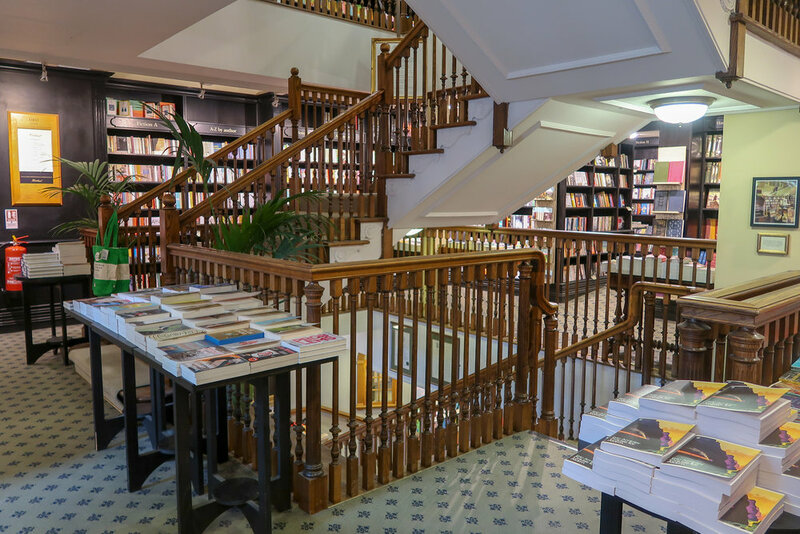 Daunt Books was founded in 1990 in the beautiful Edwardian premises at 83 Marylebone High Street in London – originally built for antiquarian booksellers Francis Edwards in 1910. The intention then, as now, was to arrange books principally by country, whatever the nature of the book – fiction or non-fiction, biography, history, guide or novel – and in so doing creating wonderful browsing both for the traveller and the general reader. I really like this principle, which allows you to discover new things constantly. Later on new shops opened across London, but the one in Marylebone is where you have to be. Loveable because they have every travel book you could think of. Trust me. Their website says: "Today, Stanfords Covent Garden is considered the biggest travel bookshop in the world with the largest collection of maps, books, travel accessories and globes under one roof." This says it all. Loveable because it's huge and so beautiful! I could spend a day here. Their previous store on Charing Cross Road was pretty amazing, but the new one (opened June 2014) is just wow. Four miles of bookshelves on four floors. Alongside books, they also have a wide range of gifts and stationery, magazines, dictionaries, printed music, classical music CDs, DVDs as well as a cafe and an auditorium. The building itself is already worth a visit. Loveable because it's London's oldest bookshop. Hatchards is London’s oldest bookshop, having been established in 1797 by John Hatchard. Hatchards has been a landmark on Piccadilly, since Georgian times, occupying the current building, number 187, for over two centuries. Loveable because they have everything a culture freak could want. They have books, magazines, gadgets, design, jewelry, t-shirts, etc. The people are also very friendly. Also, if you're looking for a nice and original birthday present, this might be the place to be. I am a book lover. Did you notice already? Waterstone's Piccadilly can compete with Foyles (six floors). The beautiful art deco building (a former department store) is really nice to hang out. The staff is very friendly as well! Loveable because this is the place to be when you love stationery. Various locations all over London, even in St. Pancras. Loveable because it's Scandinavian stationary. This shop and all of the products are so nice, it's very hard to choose something. The minimalistic Scandinavian vibe is all over the place.